一些问题 - wbuntu - Do you remember? You use the NSTimer class to create timer objects or, more simply, timers. A timer waits until a certain time interval has elapsed and then fires, sending a specified message to a target object. For example, you could create an NSTimer object that sends a message to a window, telling it to update itself after a certain time interval. Timers work in conjunction with run loops. To use a timer effectively, you should be aware of how run loops operate—see NSRunLoop and Threading Programming Guide. Note in particular that run loops maintain strong references to their timers, so you don’t have to maintain your own strong reference to a timer after you have added it to a run loop. A timer is not a real-time mechanism; it fires only when one of the run loop modes to which the timer has been added is running and able to check if the timer’s firing time has passed. You specify whether a timer is repeating or non-repeating at creation time. A non-repeating timer fires once and then invalidates itself automatically, thereby preventing the timer from firing again.By contrast, a repeating timer fires and then reschedules itself on the same run loop. A repeating timer always schedules itself based on the scheduled firing time, as opposed to the actual firing time. For example, if a timer is scheduled to fire at a particular time and every 5 seconds after that, the scheduled firing time will always fall on the original 5 second time intervals, even if the actual firing time gets delayed. If the firing time is delayed so far that it passes one or more of the scheduled firing times, the timer is fired only once for that time period; the timer is then rescheduled, after firing, for the next scheduled firing time in the future. 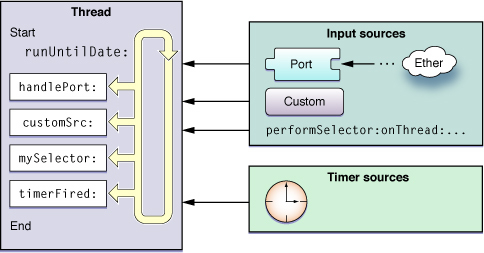 A timer object can be registered in only one run loop at a time, although it can be added to multiple run loop modes within that run loop. Once scheduled on a run loop, the timer fires at the specified interval until it is invalidated. A non-repeating timer invalidates itself immediately after it fires. However, for a repeating timer, you must invalidate the timer object yourself by calling its invalidate method. Calling this method requests the removal of the timer from the current run loop; as a result, you should always call the invalidate method from the same thread on which the timer was installed. Invalidating the timer immediately disables it so that it no longer affects the run loop. The run loop then removes the timer (and the strong reference it had to the timer), either just before the invalidate method returns or at some later point. Once invalidated, timer objects cannot be reused. The number of seconds between firings of the timer. If <em class="parameter-name">seconds</em> is less than or equal to 0.0, this method chooses the nonnegative value of 0.1 milliseconds instead. The object to which to send the message specified by <em class="parameter-name">aSelector</em> when the timer fires. The timer maintains a strong reference to <em class="parameter-name">target</em> until it (the timer) is invalidated. The message to send to <em class="parameter-name">target</em> when the timer fires. The user info for the timer. The timer maintains a strong reference to this object until it (the timer) is invalidated. This parameter may be nil. If YES, the timer will repeatedly reschedule itself until invalidated. If NO, the timer will be invalidated after it fires. Stops the receiver from ever firing again and requests its removal from its run loop. This method is the only way to remove a timer from an NSRunLoop object. The NSRunLoop object removes its strong reference to the timer, either just before the invalidate method returns or at some later point. If it was configured with target and user info objects, the receiver(在这里也就是timer) removes its strong references to those objects as well. You must send this message from the thread on which the timer was installed. If you send this message from another thread, the input source associated with the timer may not be removed from its run loop, which could prevent the thread from exiting properly. Your application cannot either create or explicitly manage NSRunLoop objects. Each NSThread object, including the application’s main thread, has an NSRunLoop object automatically created for it as needed. If you need to access the current thread’s run loop, you do so with the class method currentRunLoop. The NSRunLoop class is generally not considered to be thread-safe and its methods should only be called within the context of the current thread. You should never try to call the methods of an NSRunLoop object running in a different thread, as doing so might cause unexpected results. The purpose of a run loop is to keep your thread busy when there is work to do and put your thread to sleep when there is none.